Sponsors receive the same reimbursement amount for each meal and snack served, but meals served at sites located in rural areas or that prepare their own meals (“self prep”) are reimbursed at a slightly higher rate than other sites. The number of meals that a site can serve each day depends upon how the site qualifies to participate in Summer Food. Sites that are located in low-income areas (where at least 50 percent of the children are eligible for free or reduced-price school meals) or that serve primarily low-income children (at least 50 percent of the children enrolled in the program are eligible for free or reduced-price meals) can provide a maximum of two meals a day. They can provide breakfast and lunch, breakfast and dinner, or a meal and a snack, but they cannot provide both lunch and dinner. Sites serving primarily migrant children can provide three meals a day. Camps also can provide three meals, but are only reimbursed for children who are eligible for free or reduced-price meals. Meals and snacks served in Alaska and Hawaii are reimbursed at a higher rate because of these states’ high cost of food. breakfast reimbursement and additional lunch reimbursement, as well as the additional six cents for meeting the new school nutrition standards, if they qualified for them during the school year. Under the Seamless Summer Option, sites can serve the same number of meals that they are able to serve through Summer Food Service Program (see above). In addition, schools can operate the School Breakfast and National School Lunch Programs to feed children who attend summer school. These schools are reimbursed based on the students’ eligibility for free, reduced-price or paid meals. 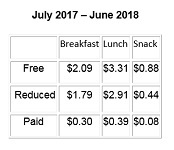 The reimbursement rates listed above do not include the value of commodities (or cash in lieu of commodities), $0.23 for school year 2017-2018, which schools receive for each lunch served. Meals and snacks served in Alaska and Hawaii are reimbursed at a higher rate because of these states’ high food costs.